The rally did not last long, though. While investors' immediate reaction to the court ruling was of the unsurprising knee-jerk variety, reality started to set in over the last few days and solar stocks took a nosedive as sharp as the rally they enjoyed the week before. Just what the solar companies needed after the ruling that threatened their chances of survival. 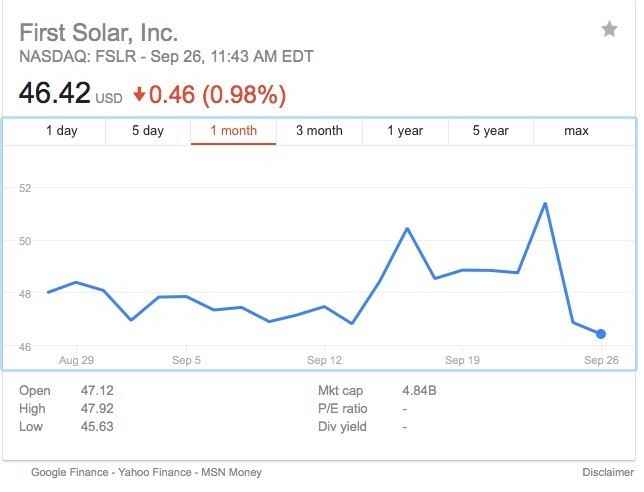 Last Monday, First Solar's stock reversed to US$46.88 as investors started to wrap their heads around the actual implications of the ITC ruling. As of late-morning trading on Tuesday, FSLR was at $46.44, down 0.94 percent on the day and down over 5 percent on the week. Irina Slav is a writer for Oilprice.com where this originally appeared.